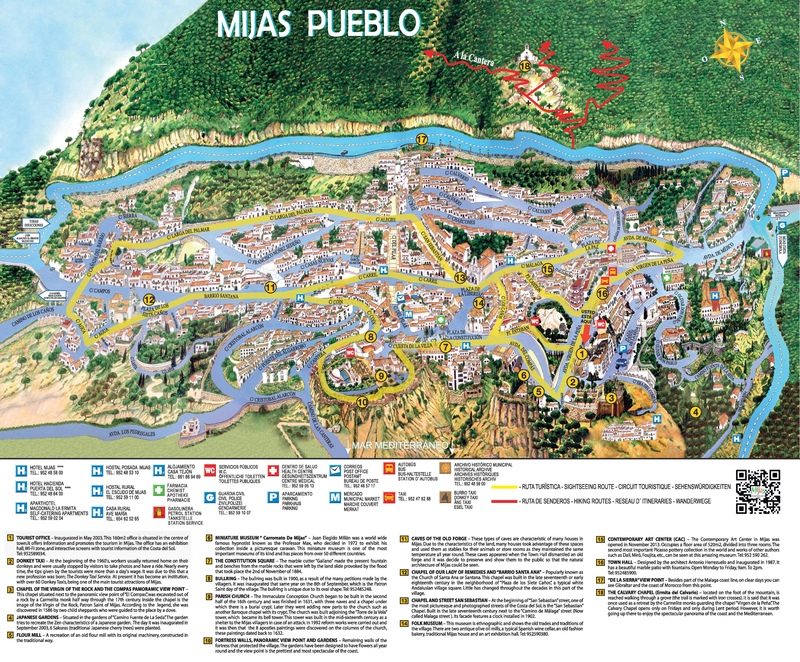 Mijas village ‘pueblo’ is one of the most famous traditional “white” villages in Spain. Overlooking the Mediterranean sea, Mijas is a jewel on the Costa del Sol and famous for its exuberant festivals, Easter processions and donkey taxis. The friendly locals ‘Mijeños’ are welcoming and the charming village begs to be explored. The town boasts on average an impressive 2920 hours of sunshine a year. Situated in between Marbella and Malaga and high up above Fuengirola, Mijas is a beautiful picturesque typical Spanish village. Follow the winding road up from the coast towards the village, its white-washed houses clinging to the hillside. Mijas is a popular tourist destination that has managed to retain most of its Spanish individualism and character. There are lots of great local Mijas bars and restaurants to try when you visit. Dotted around the village are view-points and resting places, one of the most beautiful is a park located beside the Mijas bullring; “The Muralla Gardens” which offers fantastic views of the area including the old part of the village and the coastal region. The main plaza, Plaza de la Virgen de la Pena is another area to relax and enjoy the atmosphere of the village, the Plaza is also home to a bandstand where free flamenco shows take place every Wednesday. Another plaza, La Plaza de la Constitucion is in the heart of the village and in the centre of the square is a beautiful fountain which was by Galiano. The plaza is surrounded by several cafés, bars and shops. In Mijas, there is always something going on. Festivals and performances are relentless during the summer season. For more information check our things to do in Mijas. Wandering around the streets of Mijas, you will find small shops on most of the streets offering a wonderful selection of local products including ceramics, leather, honey and jewelery. You may notice the enticing aroma of caramelised almonds, which are made fresh in several places throughout the village. There are several “garrapiñadas” vendors cooking and selling these lovely treats on the street. One of the most distinctive methods of travel in Mijas is by donkey-taxi, a donkey ride that will take you around the streets. Also available are donkey pulled carts and horse carriages as well. The donkeys are situated close to the tourism office, while the horse and carriages are in front of the main plaza. Both tours offer a unique way to see this beautiful village. Mijas village has several levels, with each street advancing up the mountain although there are many narrow streets and paths that interconnect this village and are a great way to explore. There are plenty of things to do in the Mijas. Attractions include the village bullring, the local museums and art galleries. There are some well-kept old churches to visit and several walk routes in the hill overlooking the village. Gibraltar airport does have some limited flights and is roughly 1 hour drive. Some people visiting the Costa del Sol do arrive via the airport of Jerez, travel time by car is 2 1/2 hours.